"Howlin' Wolf's voice, once heard, can never be forgotten -- coarse, rasping, his almost violent growl and eerie falsetto ruled the blues. A larger than life, almost mythic figure whose significance and influence still echoes through American music, Wolf's canny synthesis of Mississippi tradition, aggressive creativity and expressive power elevated him to the pinnacle of blues demonology. Equally at ease conjuring full throated rampage and lowdown contemplation, Howlin' Wolf's mixture of raw dynamism and subtle emotion was unrivaled. When soon the singer walked out of the Arkansas cotton fields and into a Memphis studio in 1951, the blues were never the same again, and when Chess released 1959's Moanin' in the Moonlight, the first ever Wolf LP, everything changed. Packed with unforgettable classics, the album showcases Wolf's full, powerhouse blues spectrum, and it's an electrifying experience from start to finish." "Howlin' Wolf's intense, soulful brand of blues was unrivaled. Larger than life, brilliantly expressive, Wolf's mix of raw emotion and far reaching, almost mystical songs grab ahold of the listener and refuse to let go. His supercharged shout still resonates across the decades, both as an unforgettable, profoundly influential voice and as a maverick artist who completely redefined the blues. Wolf's powerful fusion of Delta tradition and his own highly personalized style is never less than electrifying, a hot, sweet, rampaging bellow unlike anything that came before or after. As Sam Phillips famously said, Howlin' Wolf 'had such a soulful sound that when it came out, it was as if everything just stopped, everything that was going on. Time stopped. Everything stopped. And you heard the Wolf.'" The legendary Howlin' Wolf recorded dozens of stellar Chicago blues singles for RPM and Chess Records between 1951 and 1962. In this stunning compilation is a selection of incredible rarities from the first decade of his career. Edition of 500 (numbered). Limited-edition colored vinyl. "Continuing in our series of Chess Record Reissues, Jackpot Records presents this compilation of landmark original studio singles, from Chicago blues artist Howlin' Wolf. Originally recorded from 1954-1965. Howlin' Wolf electrified the sound of the Mississippi Delta blues and brought it to Chicago, laying down what would become the foundation of rock and roll in the early 1950s. Delivered in his gruff, haunting voice, his lyrics spoke of his hard life experiences and his signature growlin' mesmerized audiences and blues musicians alike. 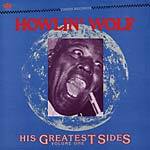 Howlin Wolf helped make Chess Records a historic label and solidified Chicago as the world's capital of blues." 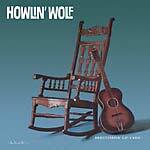 Collecting six singles released between 1960 and 1962, the self-titled Howlin' Wolf album, often referred to as "The Rocking Chair Album", is one of the most essential and immortal of Chicago electric blues albums. Featuring almost entirely songs by the great Willie Dixon, this album from Chester Burnett, inspired everyone from Led Zeppelin to The Rolling Stones, Taj Mahal to Jack White. Another all-time classic back in print thanks to Rumble Records. Exact repro of this 1979 collection featuring recordings from 1951, 1956, and 1957. Tracks include Wolf's originals like "Hold Your Money" and "Crazy About You Baby," plus "Saddle My Pony," an adaptation of a Charlie Patton song. 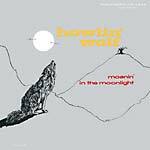 "1959's Moanin' in the Moonlight was Howlin' Wolf's first long-playing album for the Chicago-based Chess label. It was a compilation of previously released singles spanning an eight year period (from 1951-1958), beginning with his first single--1951's 'How Many More Years'/'Moanin' At Midnight' -- which immediately shot to the top of the R&B charts, all the way through to 1958's 'Moanin' for My Baby'. During the 1950s, the Wolf had two more top 10 hits, 'Smokestack Lightnin'' (perhaps his single most influential song) and 'I Asked For Water (She Gave Me Gasoline)', also featured here." "When one talks about the career of Chicago blues legend Chester 'Howlin' Wolf' Burnett, a few distinct time periods come to mind. The traditional acoustic flair of his early formative years, his peak years from the late 1950s to the mid 1960s, his brief and controversial foray into psychedelic music in 1969, and his electric blues return-to-form from the 1970s onward. Precious little acclaim has thus far been paid towards Howlin' Wolf's middle-period material. 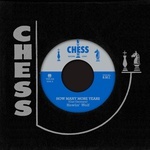 A year before the famed bluesman's death, in 1975, Chess Records released the album Change My Way as part of their 'Chess Blues Masters Series' of albums (which also featured albums by contemporaries like Little Walter and Muddy Waters). 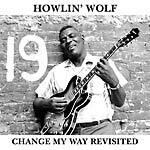 Change My Way offers an intriguing glimpse of Wolf's growth as a musician, and development and coming into his own as an artist, collecting oft-overlooked sides from 1959 to 1963, ending just before the time when Wolf achieved widespread international success. The lineups are constantly shifting from track to track, but feature frequent appearances from great names in blues session musicians as Buddy Guy, Willie Dixon, Jimmy Rogers, Johnny Jones, Sam Lay, and the one constant across all the tracks; Howlin' Wolf's longtime collaborator guitarist Hubert Sumlin. Wolf himself (and his trademark vocal rasp) is a powerful presence across the 15 songs that occupy Change My Way. A must-have for any blues enthusiast that stands proudly among the best of Howlin' Wolf's released material." 2013 repress. "1971 marked a tumultuous yet historic year for Chicago blues legend Howlin' Wolf. His health failing after suffering a second heart attack, doctors discovered his kidneys were also shutting down and he was ordered on dialysis to save his life. Wolf's doctors demanded that the legend quit performing at all costs, but the legendary blues musician did not have any quit in him. Three months after being ordered never to perform again he was headlining opening night at the Ann Arbor Blues Festival. 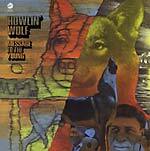 1971 also marked the release of Howlin' Wolf's second experimental offering, Message to the Young. Oft-considered his second attempt (after the Howlin' Wolf Album he famously shunned) at offering the masses a 'psychedelic' record, the sound on the record ranges from acid-rock, to blues, to funk, and back again." "1971 marked a tumultuous yet historic year for Chicago blues legend Howlin' Wolf. His health failing after suffering a second heart attack, doctors discovered his kidneys were also shutting down and he was ordered on dialysis to save his life. Wolf's doctors demanded that the legend quit performing at all costs, but the legendary blues musician did not have any quit in him. Three months after being ordered never to perform again he was headlining opening night at the Ann Arbor Blues Festival. 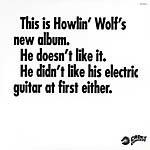 1971 also marked the release of Howlin' Wolf's second experimental offering, Message to the Young. Oft-considered his second attempt (after the Howlin' Wolf Album he famously shunned) at offering the masses a 'psychedelic' record, the sound on the record ranges from acid-rock, to blues, to funk, and back again." 180 gram vinyl. 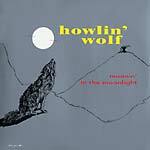 "1959's Moanin' in the Moonlight was Howlin' Wolf's first long-playing album for the Chicago-based Chess label. It was a compilation of previously released singles spanning an eight year period (from 1951-1958), beginning with his first single--1951's 'How Many More Years'/'Moanin' At Midnight' -- which immediately shot to the top of the R&B charts, all the way through to 1958's 'Moanin' for My Baby'. During the 1950s, the Wolf had two more top 10 hits, 'Smokestack Lightnin'' (perhaps his single most influential song) and 'I Asked For Water (She Gave Me Gasoline)', also featured here." "It's not often that an album disavowed by its own author at the time of release goes on to become considered a modern classic. Yet that's exactly what happened with Chicago blues legend Howlin' Wolf's 1969 LP The Howlin' Wolf Album, a release that has since attained mythical status due to the controversy behind it. 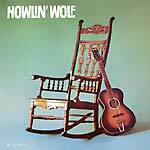 Released on Cadet Records, a subsidiary of legendary imprint Chess Records, The Howlin' Wolf Album was a radical experiment for a well-established artist: attempt to integrate electric instruments and psychedelic arrangements into his revered signature blues sound. The result was an album that Wolf himself initially disregarded on the now infamous cover, but one that has won a special place amongst dedicated music aficionados thanks to its unique mix of traditional blues and electric rock elements. Get On Down's reputation for high quality reissues continues with The Howlin' Wolf Album, which features audio remastered from the original analog tapes for optimum sound quality." Digipak release. 2018 repress. "It's not often that an album disavowed by its own author at the time of release goes on to become considered a modern classic. Yet that's exactly what happened with Chicago blues legend Howlin' Wolf's 1969 LP The Howlin' Wolf Album, a release that has since attained mythical status due to the controversy behind it. Released on Cadet Records, a subsidiary of legendary imprint Chess Records, The Howlin' Wolf Album was a radical experiment for a well-established artist: attempt to integrate electric instruments and psychedelic arrangements into his revered signature blues sound. The result was an album that Wolf himself initially disregarded on the now infamous cover, but one that has won a special place amongst dedicated music aficionados thanks to its unique mix of traditional blues and electric rock elements. 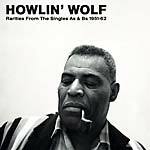 Get On Down's reputation for high quality reissues continues with The Howlin' Wolf Album, which features a special Stoughton vinyl pressing with audio remastered from the original analog tapes for optimum sound quality and comes packaged in a paste-on style jacket featuring the album's famous original artwork."